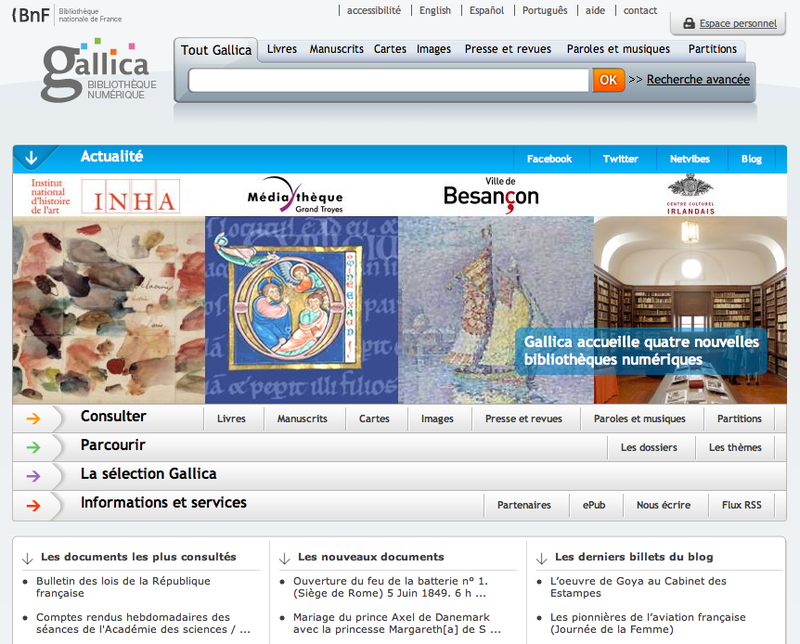 With its 500 new entries each month, Gallica is a growing online library, offering free access to over 70,000 records and 80,000 images from the National Library of France and providing a rare collection of French and francophone works, special dossiers and journals (and also some foreign works) on different subjects (history, law, economics, political science, philosophy and literature) from the14th to the 20th century. An extraordinary possibility of historical research is given by a group of administrative and political science dictionaries published since the 18th century. Records are available in image format or in text format (selection of the original text where a lexicographic search is possible); iconographic collections as well as thematic collections are also provided, through a completely open and free access. Materials (texts, maps, images, sounds) are entirely retrievable and downloadable. The website, only in French (as most part of the documents), also provides thematic sections, divulgative tours into a topic, chronological frameworks and bibliographical supports. Materials are retrievable for free, also using a multiple-choice search tool.